Viewing 0 current events matching “information” by Date. Viewing 24 past events matching “information” by Date. This Shore 'n Tell event - powered by Matrix Networks - is an opportunity for businesses both big and small to experience the revolutionary ShoreTel IP phone system. Come see what is new in UC (unified communications) and how a trusted partner like Matrix Networks can help ensure your solution matches your business and your staff. Sep 16, 2014 Portland Code School - Happy Hour! Sep 23, 2014 Portland Code School - Happy Hour! Sep 30, 2014 Portland Code School - Happy Hour! Oct 21, 2014 Portland Code School - Happy Hour! Oct 28, 2014 Portland Code School - Happy Hour! You can register at the link below until end of day Tuesday April 18, 2017 for the early registration pricing. Price: The chapter meeting is subsidized by chapter memberships and sponsors. There is a nominal fee of $10 (member) or $25 (non-member) for preregistered attendees. Walk in attendee’s are welcome but will be charged $30 at the door. If you wish to become a member, please visit http://portland.issa.org/join-issa-portland/ for additional details. Chapter Sponsors: ISSA Portland would like to thank our program sponsors, who help make high quality programs like this possible. On September 7th, 2017 Equifax Inc., one of the largest three credit intelligence corporations in the world announced that it had been compromised from Mid-may through July of 2017. This breach resulted in the loss of information, including Social Security numbers, birth dates, addresses and driver's license numbers, for about 143 million people. Join us Saturday, September 23rd for a free discussion regarding how this breach could affect you or your business, and what steps to take to limit the damage long term and protect your identity. We will field questions for a large portion of the event with the intent of better informing the community. It is not the core intent of this event to sell any product or service, the core goal is simply to better inform local business owners and individuals. Roses are red, violets are blue, we need net neutrality and public ownership too! Hope you like typewriters, this month's event will feature a lot of them. Comcast and other large internet service providers have successfully lobbied to repeal net neutrality, sell information about what you do online, and prevent localities from properly regulating them. Municipal broadband is the last line of defense against internet service provider abuses which threaten freedom of information, digital equality, and democracy itself. Municipal broadband is something many cities such as Tacoma, WA and Sandy, OR already have. In Portland we have been planning to build a municipal broadband network decades, now that our internet freedoms are under attack, it’s an idea whose time has come. 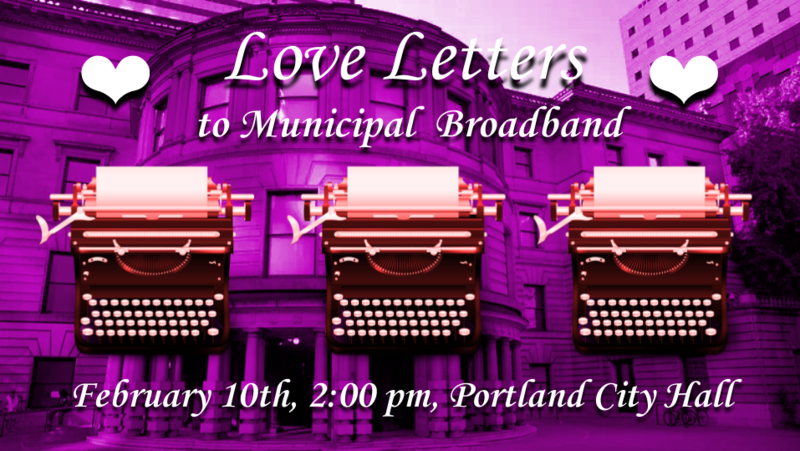 Come show your support for Municipal Broadband in Portland! Help us build visible support for the next step, which is to convince the city council to fund a feasibility study in its upcoming budget! Come learn about what you can do to make a public net neutral broadband service a reality in Portland! Invite your friends! We look forward to seeing you there! Join SANS Instructors Brian Ventura and Derek Hill for an evening of conversation regarding Secure configurations - Built-in Security Enhancements and the benefit of the CISSP certification from a hiring manager perspective. TOPICS 1. In the information security news, we regularly hear about the latest vulnerabilities with recommendations to scramble and patch immediately. This is an important aspect of our industry, however there are other security considerations. Are there configurations we can set now in our systems and software that will protect us? Let's explore secure configurations and see what we find. The Hiring Manager is looking at your resume – why does CISSP matter? While the CISSP is not the only thing we look at, it is a great starting point. What knowledge does the CISSP provide and how does one prepare for the exam? Who is Brian Ventura: Brian Ventura is an Information Security Architect by day and SANS instructor by night. Brian volunteers with the Portland ISSA and OWASP chapters, focusing on educational opportunities. For SANS, he regularly teaches CyberDefense courses like the CIS Controls, Risk Management, and Security Essentials. Brian has a Security Essentials (SEC401) course in Portland, June 18-23. Come join in the learning experience! Who is Derek Hill? Derek Hill has over 25 years of experience in IT and Information Security. He currently manages an Application Security Team, an Infrastructure Security Team (Blue Team) and a Data Privacy Engineering team at HP Inc. in Vancouver, WA. His teams are responsible for ensuring that HP’s internally developed applications are secure as well as the AWS infrastructure that is hosting these applications. Prior to his current position, Derek held IT management and technical roles at both large and small companies. In each role, he has focused on delivering excellent services, uptime and security for all the projects/staff he managed. Derek holds an MBA from Willamette University and an undergraduate degree in Management Information Systems from Oregon State University. He has various security credentials including a CISSP and multiple GIAC certifications.